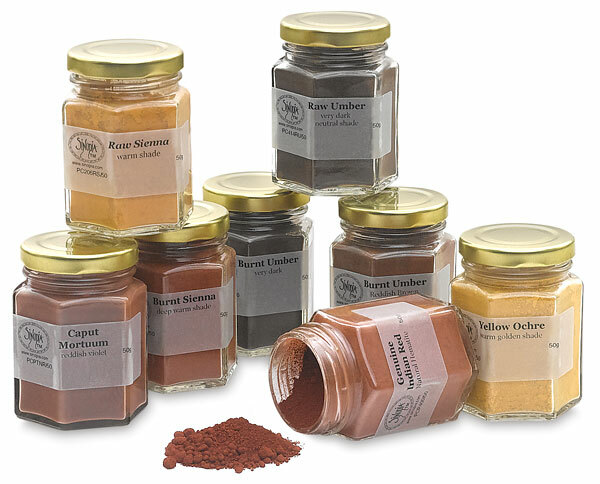 These sets are a superb introduction into the historical world of genuine earth tones, and ancient and contemporary pigments, such as Hansa Yellow, which are no longer being utilized by most major artist paint manufacturers. Sets feature convenient sample sizes of these rich pigments in 50 g jars of the most popular colors, with instructions included on how to make paint. Complete Set of 15 Colors — Includes Brilliant Yellow (Hansa Yellow), Golden Yellow Ochre (Brilliant Clear), Yellow Ochre Mexico (Brownish Cool), Raw Sienna (Deep Orange Shade), Napthol Red (Brilliant Primary Red), English Red (Extra Deep), Burnt Sienna (Warm Shade Light), Turkish Red (Mars Extra Deep), Roman Brown (Enhanced Earth), Burnt Umber (Brownish Warm), Raw Umber (Greenish Dark), Chrome Oxide Green, Phthalo Blue (Primary Blue), Ivory Black, and Titanium White. Historic Set of 8 Colors — Includes Yellow Ochre (Warm Gold Shade), Raw Sienna (Warm Shade), Burnt Sienna (Deep Warm Shade), Genuine Indian Red (Hematite), Burnt Umber (Reddish Brown), Caput Mortuum (Reddish Violet), Burnt Umber (Very Dark), and Raw Umber (Very Dark Neutral Shade). Note — Pigments are sold by weight, not by volume. Since pigments differ naturally in density, some jars may seem quite empty, while others are quite full.